We all need help creating our stories, and sometimes that means financial help. The CoJMC is fortunate that many alumni and friends have provided scholarships, allowing the college to award more than $255,599 in scholarships annually. Learn more about our scholarships, competitions, amounts, and how to apply below. 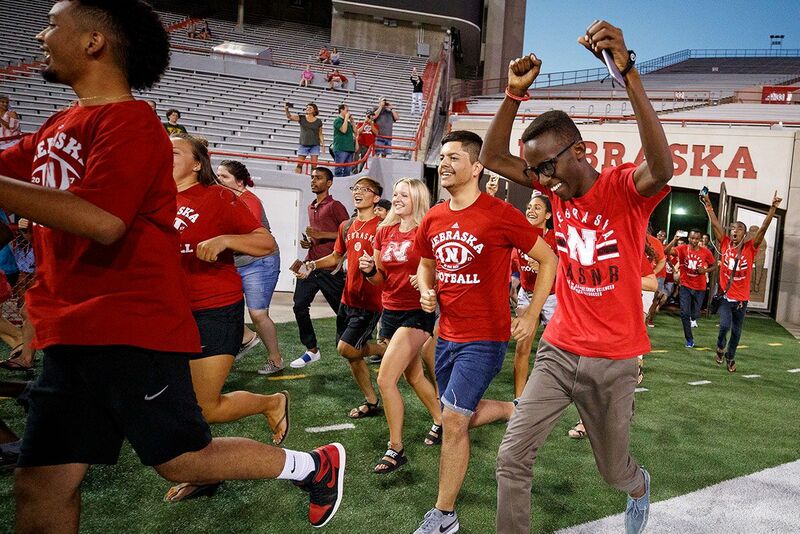 Merit-based scholarships are awarded to students who have demonstrated academic achievement and inolvement during their time at Nebraska. Merit-based scholarships can be combined with other campus-wide scholarships. Renewability varies by award. Need-based scholarships are awarded on the basis of academic achievement and financial need. To qualify for a need based scholarsip students must submit their FAFSA by April 1. Need-based scholarships can be combined with other campus-wide scholarships. Renewability varies by award. Submit a scholarship application in MyRed by February 1. To apply: submit an application, faculty letter of support and a 1,000 word essay or a 30-60 second video that explains how funding will benefit your experience. The Michael K. and Christie Cater Nelson Dream Big Fund is for undergraduate journalism majors who have been offered internships at top newspapers, magazines, websites or news services. The Deb Fiddelke Scholarship Fund supports advertising and public relations majors pursuing unpaid or underpaid internships. The Kris Malkoski Scholarship Fund supports advertising and public relations majors pursuing unpaid or underpaid internships. The J. Steve Davis Jump Start Fund supports students pursuing advertising internships in large metropolitan markets outside of Nebraska. The Dana and Lynn Roper Sports Writing Competition tests your ability to produce clear, concise, accurate and compelling stories about sports. The competition is open to all undergraduate and graduate students in the College of Journalism and Mass Communications. Submit two published sports stories, in print or online (no blogs) and a resume. The first place winner will receive a $1,000 cash award, second place $750, third place $500 and fourth place $250. The George and Evan Grimes Memorial Competition tests your ability to use written or visual storytelling to make a compelling case for the benefits of studying abroad. The competition is open to all undergraduate and graduate students in the College of Journalism and Mass Communications who have been accepted to a University of Nebraska-Lincoln sponsored study abroad course. Submit either a 1,000-word essay or a 30-60 video that demonstrates how funds will support your international experience. The winner will receive a $1,000 cash award to offset the cost of their study abroad experience. The Abe and Belle Lieberman Competition for Excellence in Reporting tests your ability to produce clear, concise and accurate reporting on public affairs. The competition is open to senior journalism majors in the College of Journalism and Mass Communications. Submit your best published public affairs story in print or online (no blogs) and a resume. The winner will receive a $1,000 cash award. The Philip Perry Photo Challenge tests your ability to tell a story in pictures while working under an intense deadline. The competition is open to all undergraduate students in the College of Journalism and Mass Communications who have at least two regular semesters (fall and spring) remaining before graduation. Register for the competition. The competition is limited to 20 students and will take place over two days. Entrants must be present to compete. The winner will receive a scholarship of up to 30 credit hours of in-state tuition and fees applied directly to their student account. The Omaha Press Club and Omaha Press Club Foundation for more than half a century have awarded journalism scholarships to the most deserving students at the University of Nebraska-Lincoln. About the donor: The oldest Omaha Press Club Scholarship was first presented in 1957 in memory of Omaha World-Herald reporter Walter Panko. More than a decade later, the name of KMTV News Director Jim Roberts was added and the award now honors all past presidents of the Omaha Press Club and Omaha Press Club Foundation. About the donor: In 1974, the Davis scholarships were established in honor of First National Bank executive John F. Davis, who helped establish the Omaha Press Club atop the bank building at 16th and Dodge Streets. The annual scholarships allowed the club to significantly expand its scholarship offerings to help students studying journalism, public relations or advertising. In recent years, the Davis family has provided funds for two annual scholarships at UNL. About the donor: Paul N. Williams was a dedicated journalist whose 27 years as a newspaperman culminated in a share of the first Pulitzer Prize ever awarded to a weekly newspaper, the Sun Newspapers of Omaha. About the donor: Stan Bond was KETV’s first field engineer, pioneering live broadcasting from remote story locations for the newsroom in which he was a full newsgathering participant. A past president of the Omaha Press Club and trustee of the Omaha Press Club Foundation, Bond received the Distinguished Club Member Award in 2001. The recipient must be pursuing a program preparing him/her for a career in news disseminated on any platform. The recipient for the upcoming fall semester must be a junior or senior at the University of Nebraska-Lincoln. Through an internship, part-time employment or other activity, the recipient must have demonstrated the intention to pursue a career in news disseminated on any platform. Working knowledge of newsgathering technology is desirable. Additional requirements: Explanation of how your academic program is preparing you for a career in news, explanation of how internships, part-time employment and/or co-curricular activities is preparing you for a career in news. About the donor: The family of James Denney created this scholarship to memorialize this veteran reporter who spent 38 years with the Omaha World-Herald. Readers knew Denney best for his feature writing, much of it focused on Cornhusker football and state history. His writing about the latter area netted him the Nebraska Historical Society’s Addison E. Sheldon Award in 1983. Additional criteria: In the spirit of Denney's propensity for writing "feel-good" stories, recipients must demonstrate outstanding work through publication as a feature writer. About the donor: Howard Silber’s widow, Sissy Silber, established this scholarship. A reporter for the Omaha World-Herald for more than 30 years, Silber became known for his sports writing and his reporting on military affairs. He became an authority on the Cold War and was one of the first reporters to break the news about the U.S. Air Force’s latest weapon, the B-2 stealth bomber. Additional criteria: The scholarship is awarded to students who have demonstrated prowess through publication as a hard news writer. About the donor: Judy Horan was a freelance writer, public relations and marketing professional who during her life made tremendous contributions to the Omaha Press Club. She twice served on the board and for nearly 20 years volunteered her time and talents to put out the Press Club’s monthly newsletter. Earlier in her career, Horan had also worked as the promotion and marketing director for WOWT-TV. Upon her death in 2017 at age 74, her friends and husband Jim (the longtime artist for the Press Club’s Face on the Barroom Floor events) raised money to create this scholarship that goes to a promising student of public relations or marketing. The family of Senator Edward Zorinsky established this scholarship in memory of the late U.S. senator and former mayor of Omaha. may involve courses in a non-communication field in which the student seeks to become knowledgeable because of its relation to career goals. For example, an applicant may take some graduate classes in business in preparation for a career in business and economic news reporting. The relation between a field of study and career objectives should be clearly spelled out in the application. About the donor: This first privately endowed Omaha Press Club Foundation award was established by colleagues and friends in memory of Mark Gautier and his long and distinguished career as news director at KMTV, Omaha. Gautier was a pioneer in the early years of Omaha broadcast news. To apply, submit an application form, upload a resume and support letter from a College of Journalism and Mass Communications faculty member, and submit additional items as specified for each scholarship.